The Welsh coastline has some of the finest beaches in Britain, so grab your flip flops and come along to discover the best! The little town of Criccieth boasts two blue flag beaches. Kids will love the giant otherworldly, mossy pebbles and shallow rockpools of Marine Beach (west of the castle) and the softer sands and enclosed bay on the eastern side. Should they get bored of the beach they can try fishing for crabs on the jetty, visit the lifeboat station (open to the public during summer), explore the history of the 13th century castle ruins or enjoy a delicious treat from the famous Cadwalader’s ice cream parlour. The long sandy beach at the traditional seaside resort of Barmouth was listed by the Guardian as one of the top ten beaches in the UK for swimming and paddling, and we definitely agree! Splash around in the shallow waters, or swim further out for a proper dip, and admire the beautiful backdrop of the Snowdonian mountains. And when you need to refuel, or warm up, there are plenty of cafes, bars and pubs just a stone’s throw away. Release your inner romantic with a trip to the beautiful Llanddwyn Island, near Newborough beach on Anglesey. The island is best known for the tragic story of Dwynwen, who retreated to the remote island to heal a broken heart and spent the rest of her days as a hermit. She is the Welsh Patron saint of lovers, and her church on the island became an important site for pilgrims in the middle ages. The movement of fish in the holy well was thought to foretell the destiny of lovers. Stretching for four miles along the western coast Harlech is one of Wales’ most spacious beaches, which means it’s perfect for old fashioned fun like kite flying. Make your own simple kite or buy a colourful one from the shops near the beach and have a go! Beaches are great spots for kite flying because the winds that blow in from the sea are steadier with fewer up and down drafts, which is what makes kites fly erratically. The nature reserve at Ynyslas is a magnificent home to many rare plants, insects and birds. The reserve is made up of the peat bog at Cors Fochno, the sand-dunes at Ynyslas and the wide Dyfi Estuary, which is an important feeding ground for migrating birds. The keen observer may even see dolphin and porpoise in the waters of Cardigan Bay. At low tides there is the eerie sight of the ancient tree stumps of the submerged forest. There is a large car park, and the visitor centre is open from Easter to September. Clough Williams Ellis’ Italianate village at Portmeirion is renowned for its fascinating assortment of Mediterranean architecture, but below the village is the tranquil beach called Whitesands Bay. Set against the backdrop of the exotic jungle-like grounds known as the “gwyllt” (wild), the wide sandy bay stretches out into the Dwyryd Estuary. When you’ve had enough of admiring the stunning views you can amble the short distance along sandy paths to Portmeirion and explore the culture and history of this magnificently quirky village. The beach is accessible from the village or from the eastern end of the Cob at low tide. Abersoch is one of Wales’ hippest holiday destinations; and with its cosmopolitan cafes, miles of honey coloured beaches and stunning coastal scenery, it’s easy to see why. The laid-back atmosphere and great beaches have attracted a thriving surfing culture, and the beaches at Porth Neigwl (known as Hell’s Mouth) and Porth Oer (Whistling Sands) are great surfing spots, that pick up the Atlantic swells sneaking in the gap between the south coast of England and the tip of Ireland. The wide, sandy bay of Hell’s Mouth (on the opposite western coastline to Abersoch) is the most popular, and daily surfing reports are available from the surf shops in Abersoch. Set beside a perfectly curved bay of white sand and sparkling blue sea is the Ty Newydd Hotel at Aberdaron. This tiny village was once the last stop for pilgrims on their way to Bardsey Island, but is now more famous for its stunning beach. Sheltered and good for swimming, this beach can often get crowded during the summer months, so arrive early for a good spot! When you tire of sunbathing and strolling along the seashore, head to the hotel terrace for a long drink to watch the sun sink quietly into the sea. What could be more reminiscent of summer holidays than opening the tent door onto glorious beach views as you shake the sand from your sleeping bag? 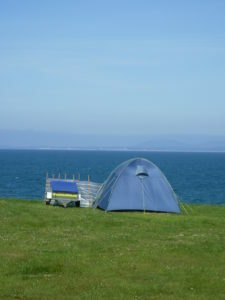 This summer, camping holidays will be more popular than ever, and Wales’ coastal campsites are among the finest in Britain. Shell Island is sprawled over 45 acres, but has all the charm of a much smaller site. You can choose from a pitch in the trees or on the sand dunes, but every pitch is just yards from one of the three beaches. The hidden coves, rocky outcrops and sheltered bays mean that the beaches of Borth-y-Gest are truly hidden gems, and only a short walk from the village. When the tide is out the rock pools are a haven for marine wildlife so children will love spotting small fish, mussels and crabs, while you relax and enjoy stunning views across the Dwyryd Estuary and all the way along Cardigan Bay. The beaches aren’t directly accessible by car so park in the village, where there are also toilet facilities and refreshments.